It is strongly encouraged to have at least two glasses of wine while getting inspired for your next creative project. I swear by it. This is less of a review and more of a public service announcement to let any crafter, writer, artist, reader or lover of lamps know how flipping great Ottlite lamps are. I have owned an Ottlite desk lamp for over five years now and it is still working like new. That being said, when Ottlite asked me to review their Duel Shade LED Floor Lamp, I could hardly contain my excitement. At my house I was doing all my crafting in a cramped bedroom turned craft room because the lighting was better and that's where I kept my Ottlite desk lamp. I'd always turn down watching movies with my husband and hanging around my family just to get a few more stitches in before bed. While I still love my craft room for messier table crafts, it is so nice to have the option to do smaller projects in my living room without sacrificing the precision that comes with good lighting. A flexible head to turn the bulbs up, down, and sideways. This is something I didn't even know I needed until I had it. Everyone will use this feature differently, but for me, I like to to keep one shade turned out to keep light over my pattern instructions and one shade turned directly over my project. I LOVE THIS! Depending on my project and where I am working it's nice to have the option to dim the lights a little. If I am crafting during the day I keep the light at its brightest but at night I like to dim it a little so that my eyes transition to a dark room easier. The USB feature is so useful, because for me, I use my phone a lot to read or watch tutorials and with my previous set up my phone's battery would either completely drain or it would need to be charging in the other room. Now I just plug it into my floor lamp, lean it on the tray, and I never have to run from room to room to figure out what the heck I'm doing! 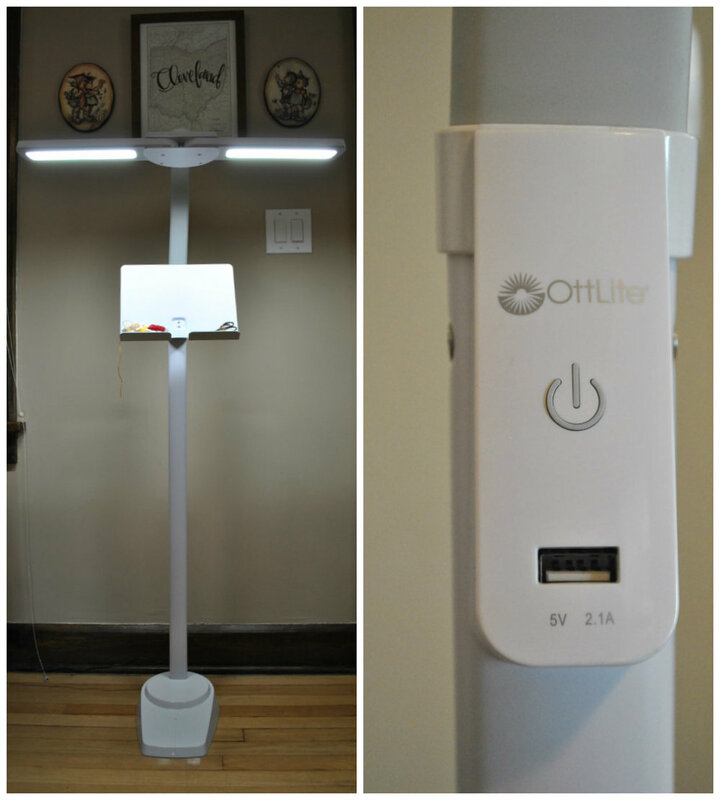 But besides all the cool new upgrades my Duel Shade Floor Lamp has, the power of Ottlite lamps remains the same. Below is an unedited difference between overhead lighting and using an Ottlite product. I can actually see the details in my stitches when I'm working and there's no more guessing on if my back stitch is lined up perfectly. Something to note is that I don't just use my Ottlite lamp for cross stitch and embroidery, I use it for practically every hobby that I have. Reading, writing, sewing, and making jewelry for examples. I even use it as lighting for product photos, and make-up application. 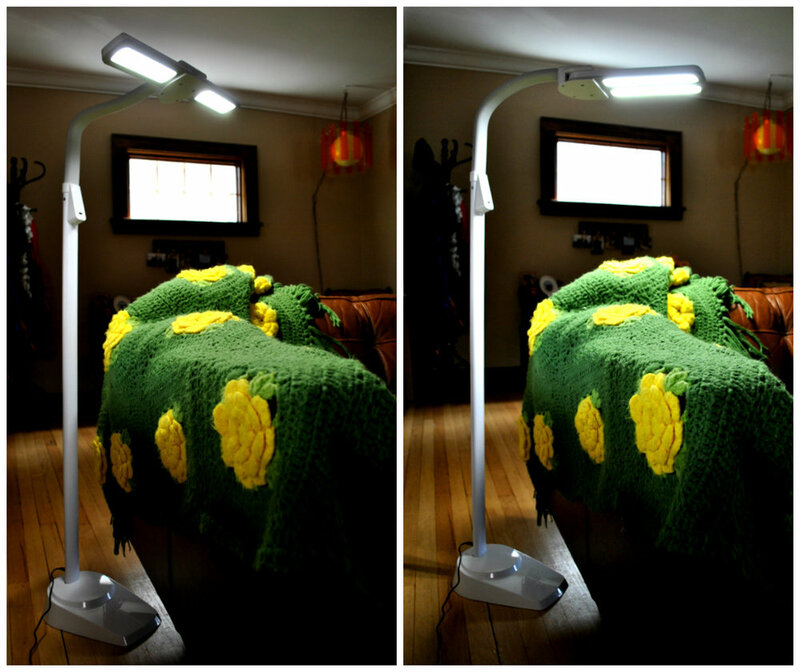 So it goes without saying that I would highly recommend Ottlite's Duel Shade LED Floor Lamp. I am finally able to stitch while binge watching my favorite shows with my husband. All I do is dim my lamps brightness, adjust the lamp's neck to be closer to my fabric and pour myself a glass of wine and I've got myself a perfect night of crafting.